If you've found yourself relaxing with a cup of tea – or something stronger – at the Book Festival at mid-afternoon anytime since 2007, you'll probably have encountered Story Shop. One of the festival's most serendipitous small moments of pleasure, Story Shop brings local authors to the international arena of Charlotte Square, with short story readings from a different writer for 10 minutes each afternoon. 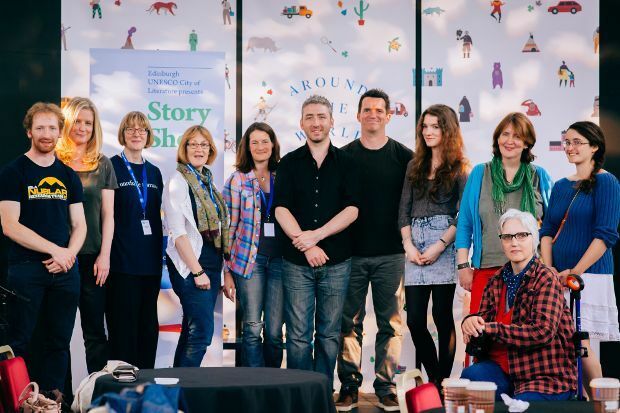 Organised by the Edinburgh City of Literature Trust, Story Shop celebrates 10 years at the book festival in 2016. Here, past Story Shop storytellers relate how the experience has affected them. Story Shop taught me the importance of putting yourself out there; to not be afraid to share your work with others. As daunting as it is to let people read your stories, and worse to read them aloud, it showed me that by being brave and believing in what you're trying to do, amazing things can happen. I took so much confidence from my Story Shop experience. I began sending more of my work to various places and was astonished to find myself short-listed for the Guardian short story competition and as a direct result published in an anthology alongside my childhood hero, Stephen King. Story Shop was the first time I'd read to an audience, so it was quite nerve-wracking, but the City of Literature team made sure I was well prepared and supported. I met some good friends from that year's group. I've read quite a few times since, and having a positive first experience definitely helped with that. It's also a brilliant thing to be able to put on covering letters and writing CVs: that you've read to an audience at Edinburgh International Book Festival. Ten minutes reading in the bookshop (as we did then) was just part of an amazing experience including a workshop, reception, Authors' Yurt pass, and meeting other writers who are still an important part of my writing community. All of it inspired me to work harder and stop dabbling. I took an OU creative writing course and started getting the odd story or poem published. In 2015, my first novel Ursula's Secret was published after winning The Sunday Mail Fiction Prize and my second is nearly finished. Definitely the right nudge at the right time for me, and I'm really not sure I'd be writing now without it. I was finding it difficult to fit writing into my busy life, so Story Shop happened at the perfect time. Reading from my novel-in-progress was a turning point; the audience responded well, laughing in all the right places, giving me renewed confidence and motivation. Without Story Shop, I might never have finished The Emergence of Judy Taylor. Soon after, I was signed by United Agents. The hardback went on to win the Book Festival's First Book Award, and the Kindle format topped the charts in the UK, France and Germany. I've just completed my second novel, The Darlings. When you first take yourself seriously as a writer, it is a huge boost when others take you seriously enough to support you. Edinburgh writers are especially lucky to have the folks at City of Literature Trust in our corner. Story Shop is just one of the ways they coax us along. It is inspirational to have a slot at the UK's biggest literary festival so early in your career. The Story Shoppers have ended up as something of a community too. We are like a benign masonry, winking at each other during readings. It is good to not feel alone. Charlotte Square Gardens, 14–29 Aug, 3pm, free. Unbound with Vic Galloway and Friends celebrates 10 years of Story Shop on 29 Aug, 7pm, free.